Do you need an instrument for your process weighing control that is fast, easy to use, flexible and affordable? Intelligent programming for ease of use. Speed and power for any process application. Reliability to meet your most demanding needs. Don’t sacrifice performance for cost! 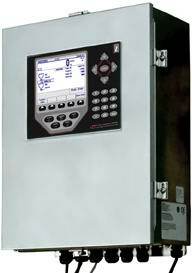 The DWC-400 process scale controller offers advanced electronic weighing technology at an affordable price. Establishing a new level of performance for straightforward weighing applications, the DWC-400 comes completely preprogrammed for fully interlocked draft weighing for hopper control applications. Choose the DWC-400 controller when fast, reliable and user friendly equipment is required for your operation. Powerful User Interface: All operator actions are easy to understand and use, accomplished through simple ‘soft keys’. All scale operations are clearly presented in real time from the large high-definition backlit LED graphical display. 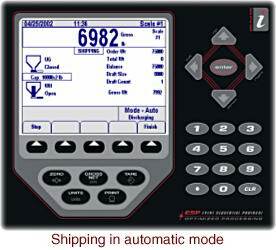 Order entry and operation of the scale is easily accomplished through the front panel, or with a standard remote PC keyboard. DWC-400 operation is very user friendly for all typical shipping and receiving applications and it’s especially well suited for continuous in-process weighing systems. Flexible: The DWC-400 combines amazing performance, speed and flexibility. As with all CompuWeigh instrumentation, you get exactly what you need for your current operation, with many available options to expand in the future. Friendly: Set up is quick and easy for your specific throughput requirements. Weighing operation may be fully automatic, or quickly toggled to manual mode, allowing for complete operator control if required. Smart: Intelligent and informative, the DWC-400 continues the CompuWeigh tradition of keeping the operator informed about all critical elements of the scale and its operation. Helpful messages and scale statuses are constantly displayed. Also, the operator is alerted of alarm conditions that require immediate attention. CompuWeigh’s Industrial DWC-400 Controller is a specially designed workhorse for harsh environments and is a part of the Compudraft Series of controllers that weigh over 50% of all the grain weighed in the U.S. This controller is easily integrated into new or existing industrial weigh hopper control applications, and protocol cards are available for open connectivity with popular networking systems like Allen-Bradley’s remote I/O, Device Net, Profibus DP as well as with an External Ethernet Module. Large 4.6″ w x 3.4″ h 320 x 240 pixel back-lit LED graphical display of scale operation. Selectable high speed A/D update rates from 7.5 to 960 updates per second. Event Sequential Protocol (ESP) prioritizes multi tasking of events at high speed for critical tasks. Front panel calibration with selectable filtering options. 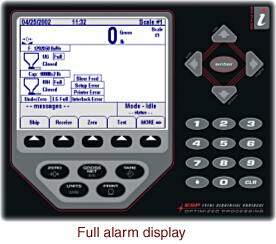 Graphical display of weighing operation showing alarms, messages, scale operation & soft keys. Communication Ports (RS-232, RS-422/485 & 20 MA current loop) for peripheral device connections. Available Communication protocol cards for Device Net, Profibus DP, External Ethernet Module.